Train Hard, Rest Easy and Party like the Season’s Over! I apologise for having been AWOL for a couple of weeks since the big race – but I haven’t gone, I’m still here – I’ve not retired early! I raced last weekend at Molesey Regatta, and am very much looking forward to the last couple of regattas before the season finishes for the summer. You may have spotted I’ve been busy with the uploads to my instagram, and since Women’s Henley I’ve had a couple of weeks off to relax and catch-up with friends that I haven’t seen since October 2012, and make the most of the amazing weather we have recently been spoilt with! 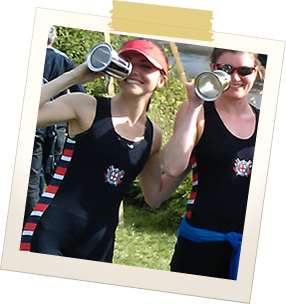 Tonight is the End of Season party at the club – despite there still being a further two regattas in the novice race calendar! – but this weekend I have some spare time, and will update this page with the latest goings-on from South West London. Well, sadly I couldn’t be there from the beginning as I was at one of my best friend’s weddings, however I made it to what I think was the second bar and most seemed to be well away! Or shall we say high spirited! I turned up stone cold sober as I had to drive, however that didn’t last long! It was a case of catch-up! It was another good night out, and nice to spend more time getting to know new faces. Due to the amount of novices at TRC this year, the club’s social committee decided to put on a start of season party to introduce the novices to the club. A pirate themed party, to which only novices seemed to have made the effort! It was a good evening though as it was nice for us all to get together without the usual lycra ensembles! As for introductions to the rest of the club members, the seniors and elites turned up much later and much more drunk than anyone else – gave us a good insight to the expected culture of the sport! It seems the drinking is just as competitive as the racing! And the mantra of work hard play harder was quite evident! As I have been dry all year – minus one or two special occasions – a girl’s day at the races isn’t the same without champagne! – I decided to test out the possibility of drinking only softdrinks at the socials, and it wasn’t that bad! However I think a few may have been on best behavior for the first party! We’ll soon find out at the next one! So the invite came through, and here I am again. Stood on the balcony at Thames Rowing Club, having been given the start of season briefing from the coaches I chatted to a few of the girls looking to sign up. Everyone seems really lovely – coaches and novices. I’ve got a feeling this could the start of something big!